It's been over 2 weeks since I've made my last post but it feels like forever. I had a dang dental implant procedure and that set me back...ti's life. But I'm back now! While I'm prefacing things I will say that I do really need to update you on what has transpired since July but for now, I want to tell you about something else. We're in the dreaded permitting phase! Honestly though, it's not that bad (yet); it's more about staying organized and remembering what form needs completing or what phone call needs to be made. I have been tasked with this assignment and my heart goes out to Chip because he's biting at the bit to get out to site of The Floridian and start building. And this stage isn't very gratifying because the "completion" of each form and permit doesn't have the same visual satisfaction that the results of physical labor has, such as we when we cleared the lot. To bide his time, and stick to our strategy of raising funds, Chip has taken several overtime shifts this month. I'm actually grateful that the permitting process is occurring during the holidays because it's allowing us to attend family gatherings and ugly Christmas sweater parties and not feel that it's taking time away from building. 1. 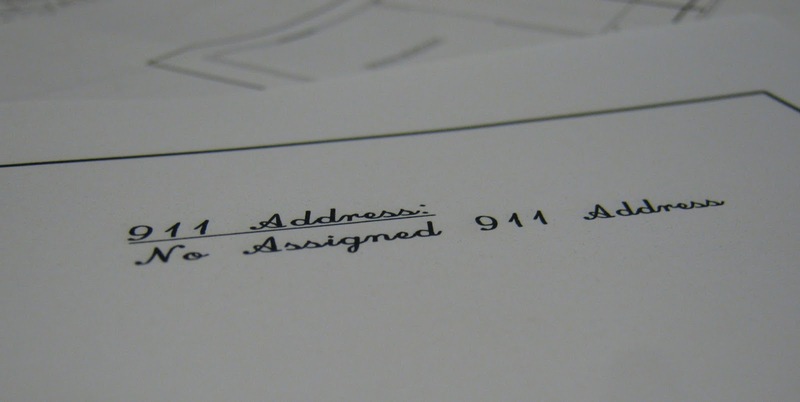 The building permit packet is like applying for college - write a resume, write an essay, take the SAT or ACT, submit test scores, pay application fee, ask for letters of recommendations, hope to get 1 of the 3 letters of recommendations back and submit. Yeah - it's like that, they want EV-ER-Y-THING at once, except colleges want you to apply. I don't know that the county offices, as a whole, have any care about you as it relates to applying for a permit. They don't seem to be customer service striving entities and the thought of having to call a county office is mildly distressing and each call is made with bated breath. Though I don't know why I feel that way, when the experience, so far, has been relatively positive. Those I've communicated with have been helpful and forthcoming with information. With regards to the latter - Lord knows you try to get all your ducks in a row and when you submit everything, all of sudden there's something else that's needed which wasn't listed and they failed to mention it. If you're like me, then you know the feeling. Drives me crazy! 2. 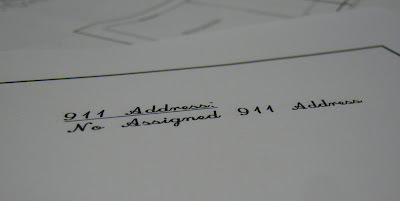 We have to apply for our 911/site address - this is the number of our physical address. Yes, it's true, we don't have one yet and surprisingly it's seems quite a challenge to obtain this. There's about 6 possible numbers it could be because we have neighbors on either side of us and we've been waiting two weeks for a response. It's the crux that's going to set the rest of the permitting forms in motion. How many county employees does it take to determine what our house number will be with only 6 options? Your guess is as good as mine. 3. The permit requires a Porta-Potty on site. This makes sense but it never dawned on us that we would need one. I called the permitting office and found that if we "just make a note on the application somewhere" that we have our neighbors permission to use their bathroom facilities and then we won't need one. Yippee was my thought until Chip crushed it with "Did you get that in writing?" and I just thought D'oh! now another phone call to make and hope that the person is reasonable and compliant to my request to get it in writing. 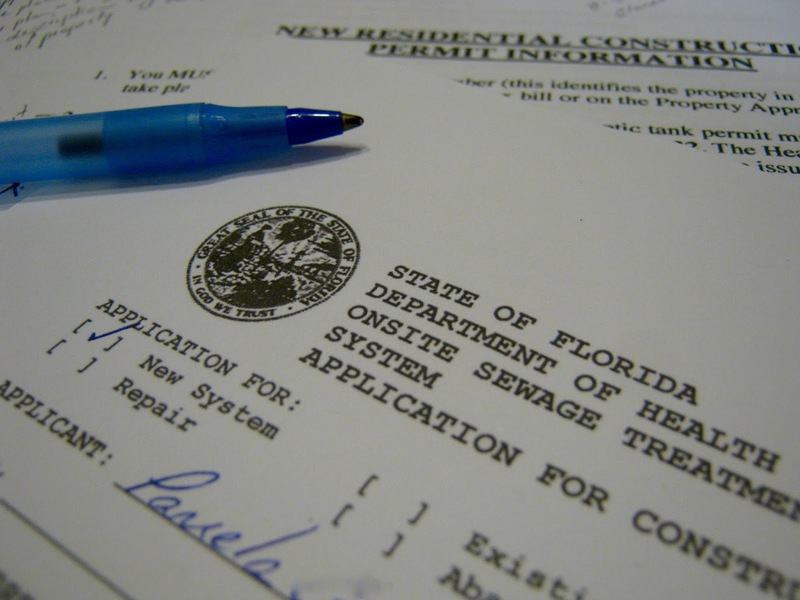 The permitting process is a learning one for sure. I've heard it takes about a month to complete the permitting forms and then about 2 weeks to hear back from the county office. I started about the first week of December so we'll see. I am hopeful that I'll make some headway during the next few days.